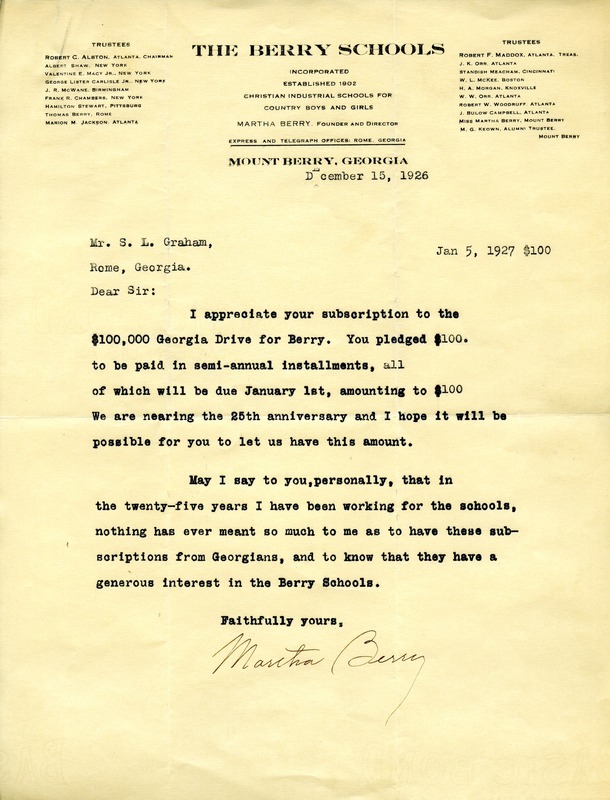 Letter to S. L. Graham from Martha Berry thanking him for his subscription to $100,000Georgia Drive for Berry. She informs him that he pledged $100 to be paid in semi-annual installments, which was due at the first of January of that year. She informs him that they are nearing the schools' twenty-fifth anniversary and hopes that he will be able to provide this amount to the schools. Miss Berry also informs him that in her twenty-five years of service to the schools that nothing has meant more to her than to have these subscriptions from Georgians showing their interest in the schools. Martha Berry, “Letter to S. L. Graham from Martha Berry.” Martha Berry Digital Archive. Eds. Schlitz, Stephanie A., Haley Fortune , et al. Mount Berry: Berry College, 2012. accessed April 24, 2019, https://mbda.berry.edu/items/show/4119.